Singapore, 10 August 2011 – Just a month after achieving his best European finish of 13th place, James Pull bettered himself with a top five finish at Round 4 of the Italian CSAI Karting Championship. Held at the South Garda Karting track in Lonato over the weekend of 5 – 7 August, the 11-year-old Singapore-based karter showed tremendous progress and found himself at the front of the 46-driver field in the Mini 60 category. Pull finished fourth in Race 1 and sixth in Race 2, well exceeding expectations. “This weekend was beyond my wildest dreams and it went extremely well. We went into the weekend with a goal of finishing in the Top 10, so to finish fourth and sixth was simply fantastic. Oliver Oakes (2005 CIK-FIA Karting World Champion), with the support of Luxor Racing Team, did an excellent job and I would like to say a big thank you to them, especially my mechanic Chris O’Hara,” said Pull. Right on pace from the first practice session, Pull qualified in 14th place, just two-tenths of a second away from the pole position time. Going into three rounds of heats next, Pull started seventh in Heat 1 and finished sixth. In Heat 2 he started in seventh again and at one point was up to second, but dropped to fourth. Starting eighth in Heat 3, he finished fourth again. Combining the results of the three heats, Pull was fifth in overall standings. Starting with a reverse grid for the Top 8 in Race 1, Pull got off to a great start into second place but eventually finished fourth after 12 laps. In Race 2, Pull was quick off the line and jumped to first place from fifth by Turn 3 of the first lap. However, he got hit at Turn 6 and ran wide, causing him to lose speed and drop places to 11th. He fought his way back and managed to catch back to sixth by the end of 15 laps. With an increased focus on training and development in Europe this year where the competition is tougher, Pull has shown amazing improvement after only five races in Europe this season. 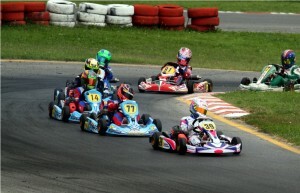 His first European appearance of the year was at Round 1 of the Italian CSAI Karting Championship in Naples in April. Next, Pull will be making his United Kingdom debut in a round of the Super One MSA Series at Clay Pigeon on 20 – 21 August before heading back to Italy for the next round of the Italian CSAI Karting Championship in Val Vibrata on 27 – 28 August. Back in Asia where Pull is driving for Dash Racing, he is currently leading the Rotax Asia Zone Challenge and Rotax Malaysia Challenge series with only one more round to go in mid-September. 2010 was Pull’s first time competing in the full season of the Yamaha SL Cup Malaysia and the Asian Karting Open Championship. Eventually finishing second overall in both series, Pull gained tremendous racing experience and he even led both Championships at certain points of the season. He also headed to Italy at the end of the summer as part of his development programme and participated at a World Series Karting (WSK) Master Series race.